But today when I “return to those thrilling days of yesteryear” I realize that this weekly TV show, and other westerns that our family watched religiously—”Gunsmoke,” “Have Gun, Will Travel,” “Bonanza”—all were variations of a common theme: The Myth of Redemptive Violence. Walter Wink coined that term, which means a belief that violence “saves,” a belief in “peace through war,” a belief in “security through strength.” For true believers of this myth, unquestioning obedience is the highest virtue, and order the highest religious value. It is the dominant myth in contemporary America, Wink says, a de facto religion more influential than Christianity, Islam, or Judaism combined. And it enshrines the ritual practice of violence at the very heart of public life. Eventually I began to see this myth for what it was. The Vietnam War opened my eyes to the systemic violence and militarism of our society. Then came the civil rights movement, with its revelations about racism and economic oppression. In those times, a new kind of hero came on the scene, one who affirmed love as stronger than hate, nonviolence as more powerful than force. This was no Lone Ranger; this was a community organizer. This vision of a fundamentally restructured America was the picture he painted in his iconic “I Have a Dream” address on the Washington Mall. This vision of a fundamentally restructured America was what took him to Memphis, and to his death, in solidarity with garbage collectors. And this vision of a fundamentally restructured America is what he planned for a Poor People’s March on Washington DC, but never saw realized. But, you know, dreamers and their dreams never truly die, as long as someone takes up the torch. Like our forebears, we are challenged to always keep striving for “a more perfect union,” as President Lincoln put it so well. A triple threat. How sad that Dr. King’s diagnosis of our society’s ills in 1967 is still current today! Yet how hopeful that his prescription has not become outdated in those 50 years! The Poor Peoples’ Campaign being resurrected here and across the nation is a remarkable rebirth of Dr. King’s dream, being expanded to also include care for the environment—in recognition that the US military is the largest single user of oil, and one of the world’s worst contributors to global warming. I hope we will all see each other again March 24, at the Poor People’s March. When I retired I sometimes told people that I pretty much slept though the ’60s, but now that I’m in my 60s, I’m waking! I thank PeaceWorks-KC, and many of you here in this room, for that awakening—for the awareness that Peace Does Work, that action is an alternative to despair. Thank you! You are my real-life heroes. One of my most cherished memories is being in a paddy wagon on a hot summer day, sweat burning my eyes because our hands were trussed behind our backs, and Henry reaching over from the other side to wipe my brow with his stocking foot. A sacramental moment. There have been similar moments with many here today, more than I can name. I am honored to be in your midst. I want to close today with a word about the Lone Ranger’s silver bullets. On the television show, the Lone Ranger says he uses silver bullets as a symbol of justice, but more important, silver bullets serve to remind the Ranger of just how heavy a price firing a gun can be. Peacemakers recognize how heavy that price is, and disarm themselves willingly, beginning with a disarmed heart. They also recognize that “there are no silver bullets,” meaning there are no simple guaranteed solutions for difficult problems. We need to remember that the civil rights movement wasn’t an overnight success, but a 10-year slog requiring lots of recruitment, training, organizing, adapting, and starting over. The Poor Peoples’ Campaign will surely be no different. But I take heart in our name, “Peace Works.” It has a double meaning. First, peace requires work. And second, peace actually works—a real alternative to the futility of militarism and violence. We need to view the Peace Works journey not as a sprint, but more as a cross country marathon—complete with obstacles. 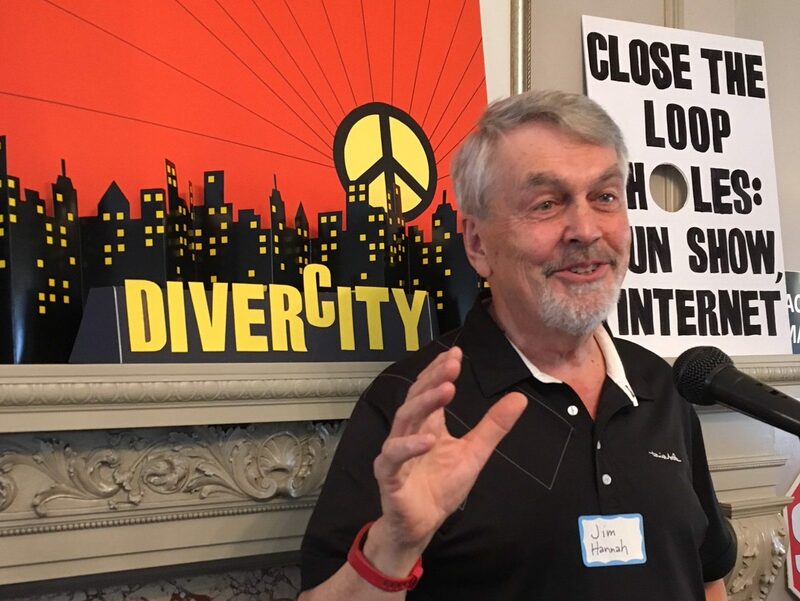 —Jim Hannah, a PeaceWorks-KC Board member, gave this address at the PeaceWorks Annual Meeting on March 11, 2018, at Simpson House in KC MO.